Navigating the real world in your 20’s is hard enough. Try doing it as an alcoholic. If you or a loved one has ever attended an Alcoholics Anonymous meeting, you are likely to have heard some variation of this slogan, “If you hang around a barber shop long enough, eventually you’re gonna get a haircut.” Here is a translation for those of you who are not “in the program”: Avoid bars and slippery places where alcohol is served because if you spend enough time there eventually you too will end up drinking again. This slogan is embedded in AA meetings alongside the acidic decaf coffee, lingering musty smell of tobacco on flannel, and the blue hard cover books dog-eared with all the raging emotions of us alcoholics. Beyond the outdated nature of the barbershop metaphor, it just plain rubs me the wrong way and always has. I suspect I am not the only alcoholic who has struggled with this. When I first entered the program as a young 20-something, the last thing I wanted to hear was that I was not supposed to go “out.” Being young and being a lonely recovering alcoholic creates a powerful alchemy of emotions and defiance. After all, my social life was already annihilated because I spent my time in a blanket of oblivion. Shortly after completing treatment, I went to a bar with some friends. It was sort like waving my hand over a hot stove and seeing if I’d get burned. I ended up leaving after a few minutes with a colossal knot in my chest and floods of tears building up in my eyes. The clink of ice in the glasses pieced through the din, the ethanol burned my nostrils. I wasn’t ready to be the sober chick at bars yet. For almost the entirety of the first year and a half I was sober, I scarcely entered bars or any slippery settings whatsoever. I spent the majority of my evenings with close friends in the program (which I did enjoy), my new boyfriend, or playing my bass guitar and writing. I nurtured the introvert in me, yet something was missing. Namely the excitement, thrill, and adrenaline of seeing live bands, which was my lifeblood. Something about recorded studio music or even live albums just cannot capture the raw, uninhibited energy of bands on stage, the sound waves reverberating through the air, the sweat flying, the vibes of the crowd. I decided I was ready to emerge from the giant protective bubble AA and sobriety had encapsulated me in and reach out. Full disclosure: I was pissed off and tired of being told what to do, how to live my life, where I could hang out, and who I could be around. I was tired of living black and white when I longed for the bright, vivid shades in between and faded gray areas. I waded in the waters of going to shows again, to bars, and eventually parties. 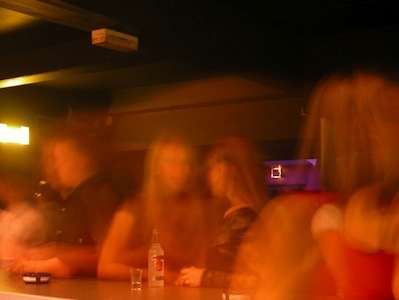 There are reasons being an alcoholic or addict at bars or parties is dangerous territory. As Dr. Thomas McClellan of the Treatment Research Institute points out in an excellent article, studies illustrate that addiction drastically alters the brain structure, which makes inhibitions and moderation difficult. Environmental cues (such as people, places, and things) “evoke strong cravings…even among those who have remained steadfastly abstinent for years.” This is why it is essential to be in a good place emotionally. Armed with this knowledge, I set ground rules for myself to tread carefully. I would not go out to slippery places if I was feeling depressed, angry, lonely, or vulnerable. I would not go just to hang out, there would have to be a special event, such as seeing a band I liked and I would have at least one friend in recovery or friend who supported my recovery to accompany me. In case of anxiety or discomfort, I always drove my own vehicle for a quick escape. I am happy I’ve reconnected with friends both old and new who are “normal” drinkers. Surprisingly, I have learned just as much from my normal friends as I have from friends in recovery, and value the lessons learned from both sets of friends equally. Recovering friends taught me to have fun without drinking/using, how to trust and love again, and helped foster my growth. We played games into the wee hours of the mornings with soda coming out of our nostrils. They inspired me to stay sober and showed me the joys recovery gives such as second chances, college degrees, children, and loving significant others. Most of all, they gave me hope. Normal friends (or “normies” as we call them in the program) have shown me what it is to let go and be free, what it’s like to not worry about drinking, and not over-analyze every situation. Just as I was not counting their drinks, they surely were not bothered by the fact that I didn’t drink, and often I received just as many comments on how much fun I was without needing to drink. I finally let go of years of unjustified and undeserved resentments I harbored against others because I was not able to be a normal drinker. The friends I hang out with now at bars or parties are friends who are not there for the booze, but instead for the camaraderie, for the music, for mingling, for the dancing. If I stayed cooped up, I’d feel like major parts of life are passing me by as a young woman who is untethered by children or marriage. I’d have missed the bands I wanted to see, theme parties like a roaring ’20s party, and seeing the sun crawl across the horizon as I attempt to fall asleep in the wee morning hours. So I learned to navigate both worlds, the alcoholic one and the normal one. Sometimes it is a tenuous place, but most of the time it works for me and that’s what matters.